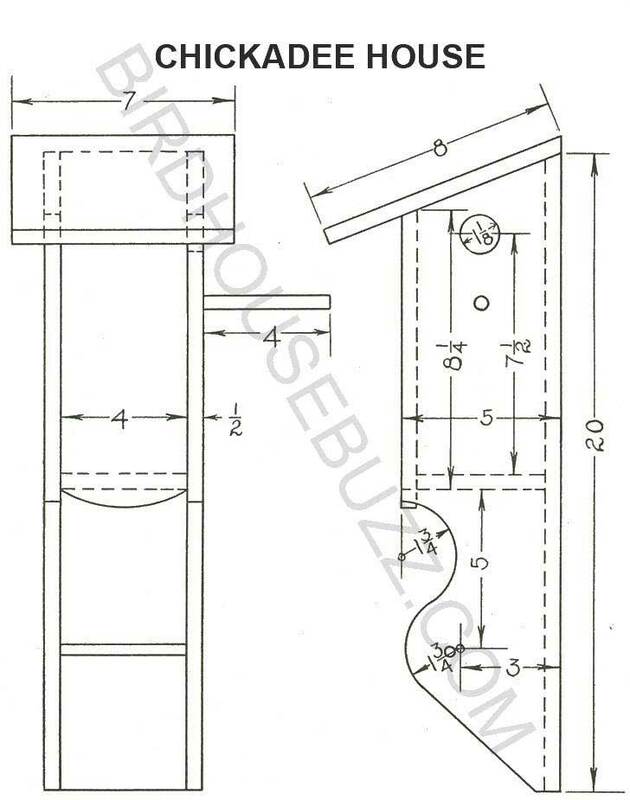 Build a chickadee bird house with free woodworking plans. These adorable little birds are found almost everywhere! There are seven different species and, depending on where you live, you've probably seen at least one or more types of chickadees hanging around your neighborhood. Since chickadees don't migrate, building nesting boxes is a great way to keep them warm and safe all year long. Chickadees typically find homes in decaying stump crevasses, so building a rustic birdhouse with old, used lumber is a good way to provide them with a safe and dry alternative. Once you've finished your chickadee birdhouse, remember to mount it between 6-feet and 15-feet high, as they don't like to be too near the ground. Since they eat both seeds and insects, a bird feeder is also a welcome way to encourage these sturdy little neighbors to stay awhile. The chickadee is one of the brave little spirits who spends the entire winter with us. In fact, they are non-migratory and live here year round! We can be of considerable service to him during the cold weather by providing food shelters. During the summer months his home is usually found in some decaying stump, therefore nesting boxes of the rustic type placed in some remote spot of the orchard or park are most attractive to him. These birds are mainly small, stocky woodland species with short stout bills. They range in length from 10 to 22 centimeters. They are adaptable birds, with a mixed diet including seeds and insects. Many species will live around human habitation and come readily to bird feeders for nuts or seed, and learn to take other foods.